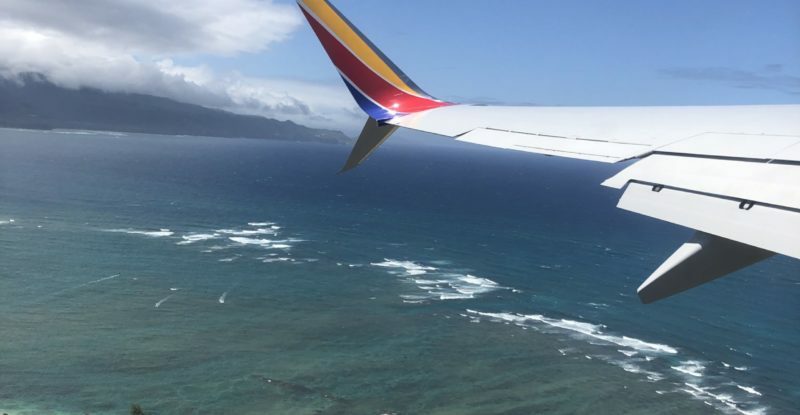 Just a few weeks after launching its first-ever Hawaii flights from Oakland to Honolulu, Southwest Airlines followed up that milestone with new service to Maui’s Kahului Airport on Sunday, 7 April. Most of the 175 passengers boarding Flight 5160 at 11:30am in Oakland, including a lucky few who nabbed $49 fares, had no idea what awaited them on this inaugural flight, until they saw luau dancers performing and a giant wave-shaped cake atop a table outside the gate. 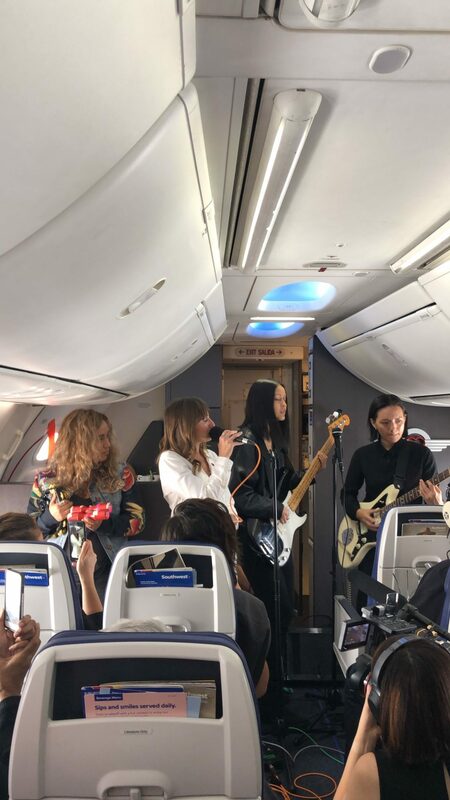 Elizabeth Bryant, vice president of Southwest Airlines University, and a Bay Area native who now oversees company training, welcomed everyone to the flight and hinted at the festivities on board. 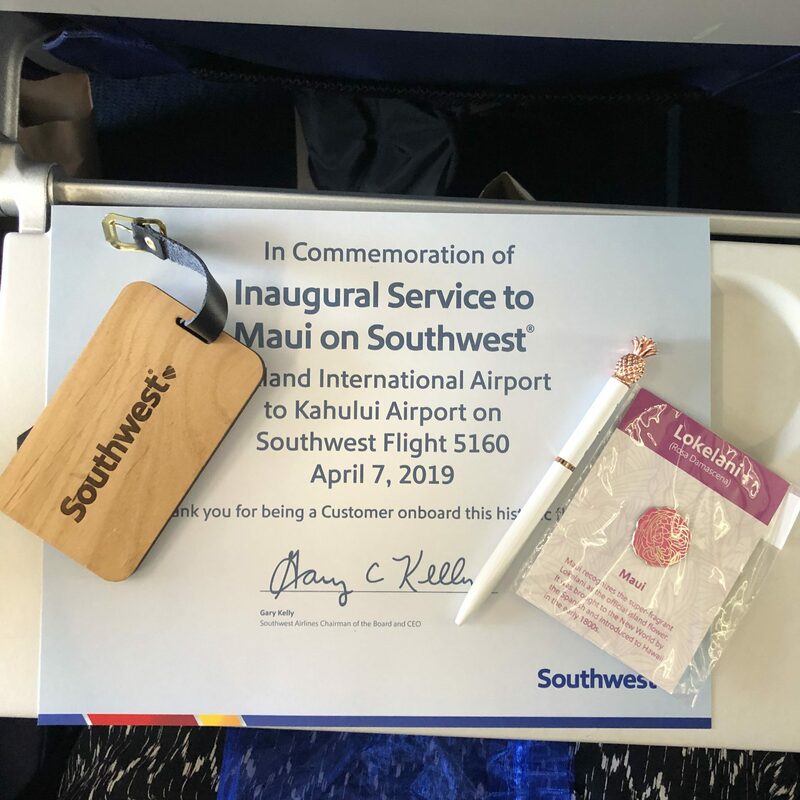 Greeting all passengers in their seats was a commemorative certificate, a Southwest-pen topped with a gilded pineapple, a Lokelani flower pin (the official flower or Maui), and a Southwest bag tag. Upon landing, passengers were treated to a full-on Hawaiian welcoming and luau ceremony, complete with leis, handshakes from Maui county mayor Mike Victorino and barbeque. 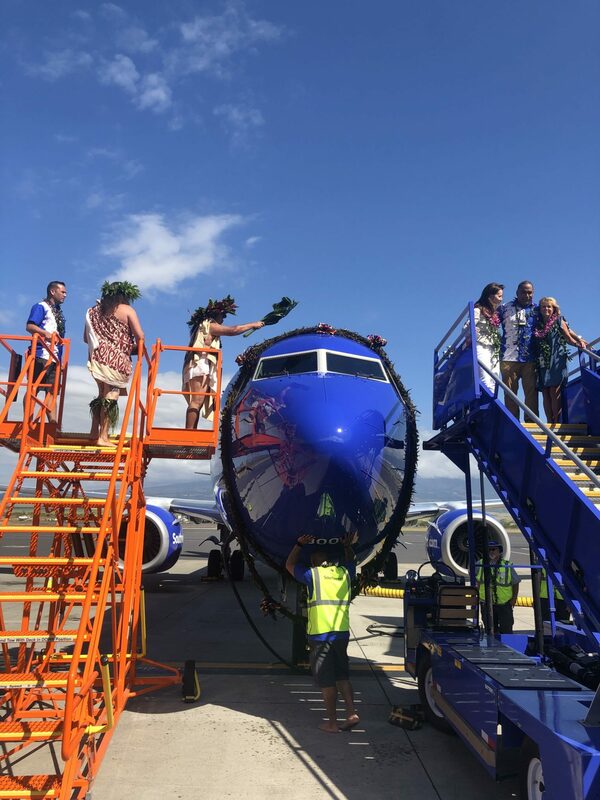 After the deplaning was complete, the flight crew sat for a Hawaiian blessing ceremony and then an 80-foot lei made from Ti leaves and coconut husks was wrapped over the nose of the plane, which also received a special blessing. Check-in is very standard and what you can always expect from Southwest, but a good perk here for Hawaii travelers is that the first and second bags are free. Southwest’s A-B-C group boarding process is also the same as it always is, but given that this is a long flight single passengers who don’t want a middle seat or want to guarantee space for their carry-on should remember to check-in early to secure an A or B boarding group. Another option is to book a Business Select seat, but when we checked fares for both later this month and in August during peak season, those seats were about $250 more than a Wanna Get Away fare, which kind of defeats the purpose of flying Southwest for its value. Then again, this open seating plan can work in your favor on less-full flights. On my return flight, I scored three seats all to myself towards the back of the plane. Having mostly flown Southwest’s older Boeing 737-700s, the -800 was a relief to see with its crisp blue seats, mood-lighting, and lighter cabin colors. 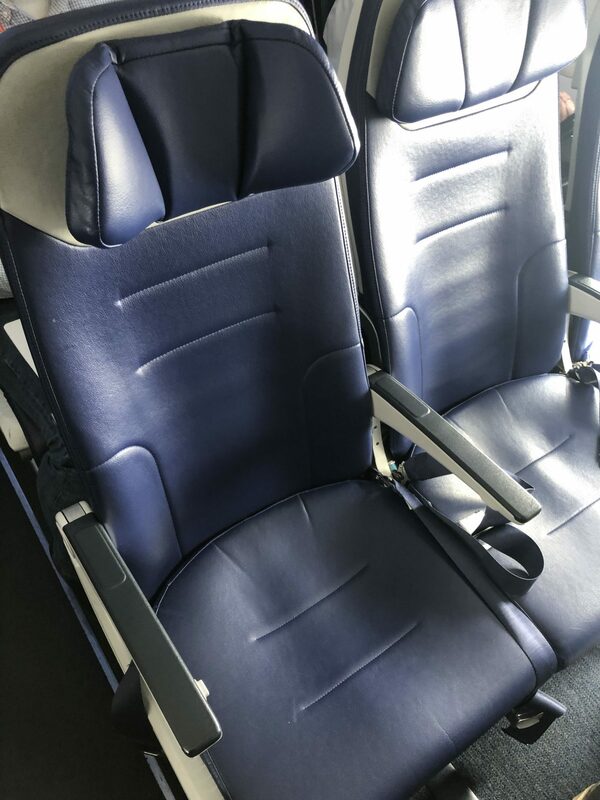 The seats have 32 inches of pitch and a width of about 17.6 inches (due to slimmed armrests). The armrests are skinny and the tray tables are simply functional, but overall, it was quite pleasant. The headrests flip out on both sides but a neck pillow is still a more comfortable option. Whether or not Southwest will use its 737 MAX planes to fly to Hawaii – something that was thought to be an eventual likelihood before the grounding – seems not to be a priority for the airline right now. 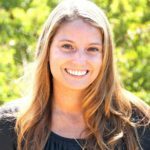 “It was always our intention to begin service to Hawaii with the 737-800, and that is the aircraft we chose for the ETOPS authorization process,” said Alyssa Foster, a spokesperson for Southwest Airlines. “There was never a timeline for submitting the 737 MAX for ETOPS certification as were focused on inaugurating service with the 737-800 and gaining ETOPS experience. Our current plan is to continue serving Hawaii with our ETOP-authorized 737-800 fleet. 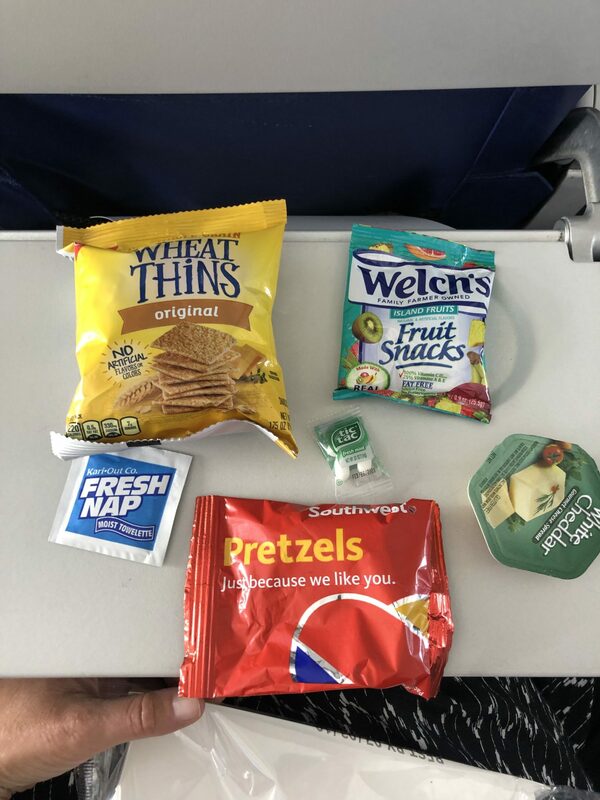 Complimentary snack boxes were provided; these include Wheat Thins, a white cheddar spread, Welch’s tropical fruit snacks, Southwest pretzels, Tic-tacs, and a hand-sanitizer wipe. It’s a long flight and drinks service can be spotty, so fill-up your reusable water bottle before the flight and grab a heartier meal before you board. That said, Southwest does have a good selection of beers, including Kona Longboard Lager, wines and spirits from about $6-$7 to help you relax a little quicker. 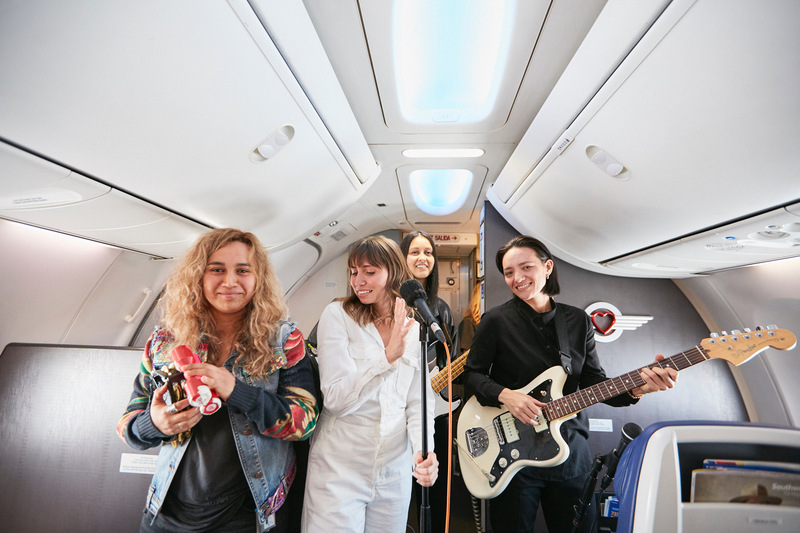 Southwest is using the Global Eagle wireless solution with Ku-band connectivity on these flights and the connection was steady for both flights across the Pacific Ocean. There were a few moments of sluggishness but then it quickly cleared up. Southwest also offers free movies and Live TV through their app during the flight. You can buy premium WiFi for the duration of the flight for just $8, a bargain compared to other airlines flying shorter distances. The one glaring downside to the flight is that there are no power ports in the seats. Even in airplane mode with the WiFi turned off and my apps all closed, my phone seemed to be losing battery strength quick. I was able to charge my phone through my laptop but it’s crucial that you charge your device fully before this flight and bring a back-up source of power. The flight crew and gate attendants were happy because, well, it’s Hawaii. Who wouldn’t be happy about flying here? And also, this is just what you can expect from Southwest – relaxed, happy, and friendly service. To prove that Southwest is one big family, Captain Kevin Vaughan, the pilot who flew the inaugural flight, gave a shout-out to his dad who was on the flight and who was a Southwest pilot in the 1970s. His two brothers are also Southwest pilots. Ohana all around! Southwest is now flying to and from Maui and Honolulu twice a day to Oakland with San Jose service set to begin in May. Sacramento, San Diego and Lihue flights are expected to be announced soon too. Curiously, Los Angeles, a larger feeder market for Hawaii, is not in the mix yet. But the bigger news is that interisland service will begin on 28 April with four flights daily from Maui to Honolulu. Several Hawaii residents told me how excited they were for this since flying Hawaiian Airlines in between the islands can get expensive. Southwest’s flights will start at $49 one-way. While flying to Hawaii will never be cheap, mahalo to Southwest for making it a little more affordable.